Color: various shades of red. Also pink and some green. The name Garnet is derived from the Greek "granatum" referring to the color of the pomegranate seeds. If it were not for its widespread availability, amethyst would be very expensive. Garnet is a regal looking, often translucent crystal. Red garnet has a real depth of colour. If it were a little scarcer it would probably be a really expensive stone. It is a stone of health, physical strength and energy. It helps activate ones internal fire, ones charisma and thirst for life. 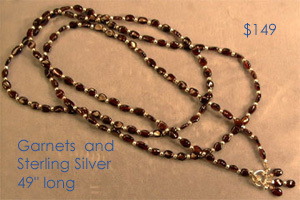 Garnet is a good stone to wear or have around you when you wish for order and balance in your life. It is a stone of emotional warmth and commitment, often used to demonstrate this between couples. Garnets are found in USA, Australia, India, China, Turkey, Russia, Pakistan and Czech Republic.